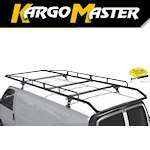 This rack fits Mini and Mid-sized pick-ups and can be used to carry ladders, lumber and other materials on your truck. The Pro III truck racks for mid & mini size pickups with a cap, have the potential to carry 1000 lbs of cargo weight. The ideal choice if you’re looking to carry moderate load or a few ladders and do not want to overload your mid or mini size pickup truck. A full length van rack that transports everything from plumbing supplies to carpet rolls to your job site with safety and style. Affordable, practical truck ladder racks. 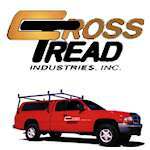 Find an assortment of truck racks and van racks here, made in USA. Pro III Truck Racks for full sized trucks, are made using the same industrial quality materials and methods which have set a benchmark in the manufacturing industry for more than 32 years. Transporting ladders and oversized items on your truck is now made possible and easier with one of the many truck ladder racks available from Contractor's Solutions. These truck racks are also useful for carrying lumber & heavy equipment, freeing up space in your truck's bed, and protecting it from damage during transportation. 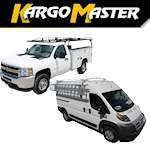 With truck racks from Cross Tread and Kargo Master, Contractor's Solutions supplies quality, well built ladder and lumber racks, providing you with the right equipment to get your job done. 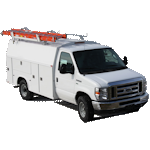 No matter your type of vehicle, from construction trucks to pickup trucks, it can be outfitted with a ladder rack, lumber rack, headache rack, cab shield, cab guard, or backrack. Not only can you purchase your ladder rack specifically for the make, model, and year of your truck, but depending on your choice, you can also choose an aluminum mount, a lightweight yet durable alternative to the equally sturdy steel mount. Additionally, most of the available models can carry loads ranging from 300 lbs. to 1,000 lbs. Lastly, many of these truck ladder racks are easy to install and require no drilling during set-up.